Overview: Drop Site is a game about delivering humanitarian aid shipments by dropping it from the sky … sort of. 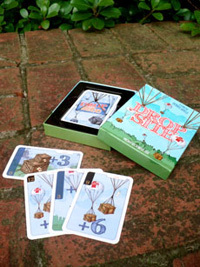 It’s a numbers-based card game with cute illustrations of crates with parachutes, and can offer some pretty tricky strategy. Rating: Pretty good, once you figure out what you’re doing. Who Will Like It? It’s a combination of press-your-luck and guessing your opponents’ strategies, and despite the theme it has something in common with traditional card games. So I’d recommend this for folks who like trick-taking games, or fans of pile-making games like Skip-Bo and Spite & Malice . As I said, the game is about air-dropping humanitarian aid, and the illustrations on the cards show the crates being delivered by parachutes. Playing cards on the drop sites represents the parachutes falling closer to the ground so you see the numbers getting lower as the crates drop. But the way that the scoring is computed based on how you play cards doesn’t really fit in with the theme. It’s not really clear how putting cards in your “debt” is an analogue to planning ground efforts to distribute the aid, so we just played it as a numbers game. One deck of 52 cards, numbered from 0 to 12. The cards are standard sized, decent quality. The illustrations are done in a hand-drawn way, as well as the big numerals in the background (which represent scores). Each card has a smaller printed number on the left hand side (at different heights), as well as the height spelled out across the top in small type. The cards are easy enough to read, but the little tiny spelled out number on the top isn’t really that useful. Drop Site cards range from 12 to 0 in height, 7 to 3 in points. Each player gets five cards. One card is turned face-up in the middle of the table, forming the first drop site. The rest of the deck is placed face-down as a draw pile. On your turn you must either play a card on a drop site or on your “debt,” and then draw a card. Drop sites are face-up piles on the table: you can create a new drop site with any card, or to play on an existing drop site you must play a lower “height” card than the current card. Once a drop site displays a “0” height card, you turn the 0 card sideways and can then play any new card on top of the current drop site to start a new drop. Your debt is a pile of cards face-down in front of you. You cannot look at cards in your debt once they are played until the end of the round. There is no limit to the number of cards in your debt. The round ends when there are a certain number of drop sites on the table: 2 players = 5 drop sites, 3 players = 6 drop sites, 4 players = 7 drop sites. The round also ends whenever the last card from the deck is drawn. Everyone reveals all the cards in their debt piles and compares them to the drop sites. For each card in your debt that matches a drop site, you get the number of points indicated by the big blue number. If a card in your debt matches more than one drop site, you get points for each match. Likewise if one drop site matches more than one card in your debt, you get points for each one. For any cards in your debt that do not match any drop sites, you lose two points. 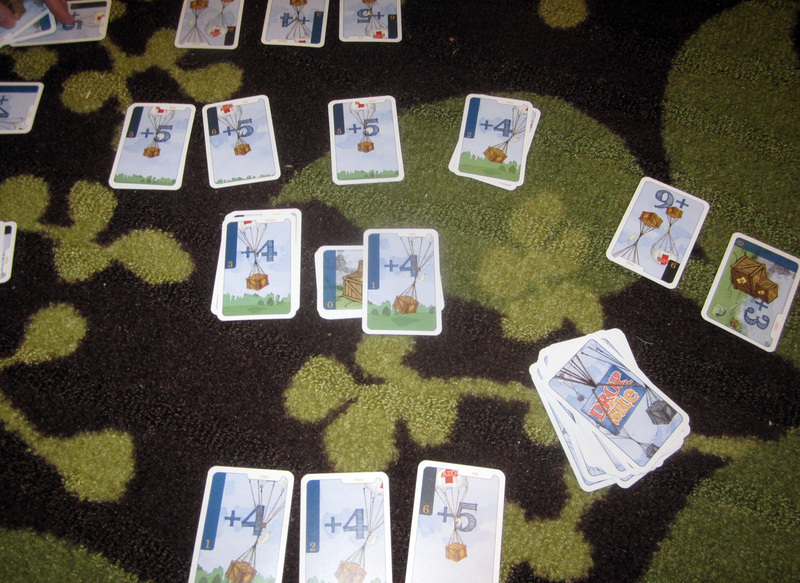 The 0-height cards, showing the crates landed on the ground, can be counted as matches even if other cards have been played on top of them. First player to 100 points wins (or you can shorten the game by choosing a different goal). I’ll admit: the first time I tried out Drop Site , I got some rules wrong and we just didn’t get it. Then, I got the rules cleared up and taught some other friends to play, but they didn’t really see the appeal. I set it aside for a while and only recently gave it another shot. Third time’s a charm, as they say. The goal of the game is to have lots of cards in your debt pile that match the drop sites. But since you can only play one card — either to a drop site or your debt — you can’t do both. If you try to play cards out on the drop sites to control what is there for matching, then you don’t get to put things into your debt for points. And if you’re trying to get cards into your debt, then other players can change what’s showing on the drop sites. What’s more, the higher cards are worth more points — but they’re also easier to change. If other players see you putting a lot of 12s on the board, then they may figure that you’re putting a 12 in your debt, and will quickly lower that drop site value. Also, since the game ends when a particular number of drop sites is made, sometimes a round will end very quickly while you’re still trying to decide which route to take. It’s a pretty nifty mechanic and really rewards players who can anticipate what their opponents are trying to do. It also plays fairly quickly, depending on what final score you’re playing for. The one thing that just didn’t click for me was the theme: I get the parachutes dropping, with the numbers getting lower and lower. And I understand the mechanics of having higher cards worth more points. But what is a “debt”? Why does putting some card in my debt pile make it worth points for some drop site? Answers to these questions aren’t necessary to play and enjoy the game, but it would have been nice to have them explained in the rules. Are these terms made up for the game, or is there some international aid jargon that I’m missing? One of my gamers suggested that maybe there was some corruption going on in the aid-delivery process, and we’re making bets on deliveries or something. Drop Site is available directly from Bellwether Games. Wired: Interesting mechanics let you press your luck against other players’ actions. Tired: Theme a little removed from gameplay; not everyone “gets” it.